Besides the internationally renowned Sónar Advanced Music Festival, simultaneously this week Barcelona celebrates Sónar +D, a Creativity & Technology event, where some of the most cutting-edge artists and researchers get together in a wondrous kaleidoscope of highly talented people. Eager to know new stunning proposals, we were there from its Day One. Our first discovering was the successful Belfast-born project Patchblocks , programmable mini-synth modules that caused a backing storm at Kickstarter. It has everything to delight inquiring musical minds: it is modular, it is funny and it is open. These modular synth units can be joined as puzzle pieces, and even they can be plugged to other musical instruments and gadgets, creating a wide range of sounds. Just “playing” with them, you realize the incredible variety of possibilities that these low-fi artifacts provide you, in a nearly-infinite constellation of combinations. There is a strong emphasis on the community side of the project, to share experiences and sounds. The perfect instrument to turn a musician into a maker! After this, Andy Goodman and John Alexiou discussed about new trends on wearable devices, with witty statements like “In wearables importance is not on the device, but on the experience”. Andy Goodman, from the design agency Fjord, placed wearables on their very initial stage, remarking the issues their development still implies: recharge difficulties, tricky use of too small screens, and ugly appearance. He pointed out the great importance of the evolution of materials as the real way to improve actual wearables: to insert an electronic artifact on a textile piece, he said, doesn’t seem to him as interesting as making the materials of the textile piece fulfill a given function. “There’s no a killer app in wearables yet”, he stated. Would it ever appear? While we were still assimilating bold Goodman’s statements as “Technology is not moral, it depends on the use we give it”, John Alexiou persuaded us with his SubPac project: tactile audio technology which give the listener the real sensation of music on their bodies. They are working on the physical dimension of sound, as sound is not simply an “ears matter” but it involves the whole body and it should be experienced like that. And, regarding the “moral use” of this technology, he mentioned at least one: saving DJs to become deaf. 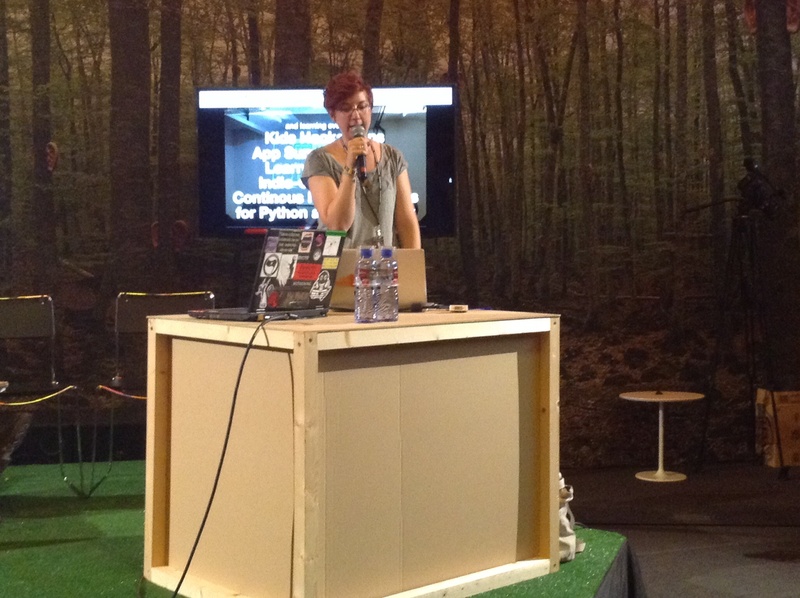 In a very different tone, Amélie Anglade talked about Hackership, a programme at OpenTechSchool in Berlin: it started three years ago, offering free workshops to learn code in different languages. After this time, it has proven to be a great tool to transform good coders in excellent hackers. For anyone interested, applies for this summer courses are still open. Alex Haché (from Dones Tech) and Klau Kinki (from Pechblenda Lab) focused their speech on the female perspective, exposing the gender point of view on new technologies. An intense mise-en-scène for a blunt talk. Lastly, multitalented artist Daito Manabe made an insightful overview on his awesome work. Acting in many of these projects more as a “Creative Technologist” than an artist, some of them involved big teams and complex coordination: from ambitious <<Sound of Honda>> to engaging <<Human Laser Projector>>, he showed a wide variety of sophisticated creations where perception, motility and free will are questioned. He explained that after some unsuccessful early experiences with dancers, he decided to use his own body for his projects. Using electric sensors linked to muscle contractions, he has developed fascinating devices which relate in the most unusual way our bodies with other people and surroundings. Fortunately, he has had highly successful collaborations with dancers lately, as <<Dance With Drones>> project shows. 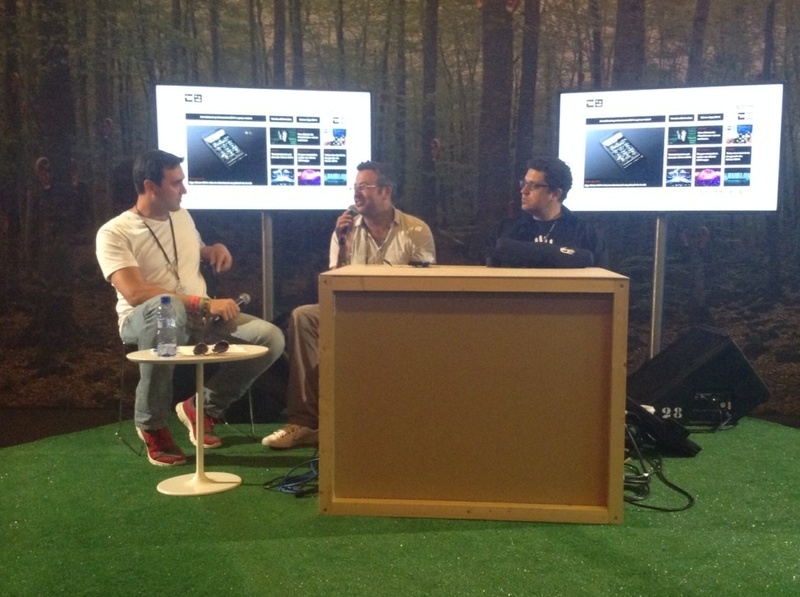 So this first Sónar +D day had inside much more than music and experimental art. We truly enjoyed of the risky proposals and piercing ideas, which left us with appetite for more. Stay tuned for our recap of Day Two.